Crystal presentation plate in flawless optical crystal, 32cm in diameter, with faceted decoration in starburst design. Ideal engraved as corporate gifts or achievement awards, offered with low-cost engraving. A touch of class. These stunning presentation plates are crafted in flawless optical crystal and feature a faceted 'starburst' design that allows light to refract through the glass in a myriad of aspects. 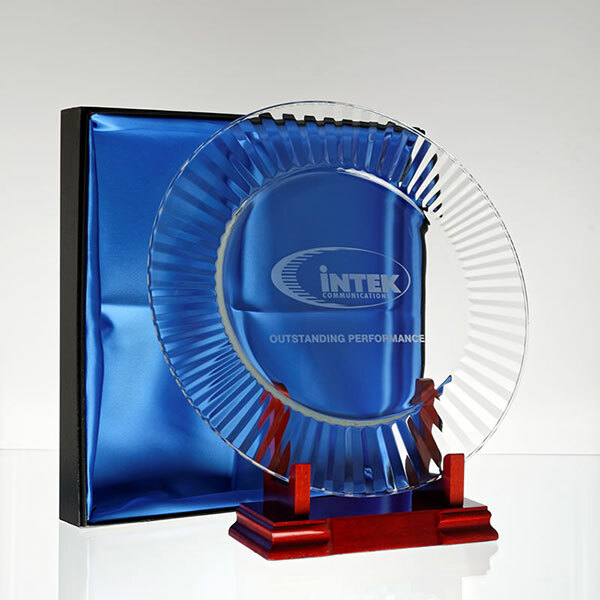 These large (32cm diameter / 12.5in) plates are perfect engraved as corporate recognition gifts or achievement awards, and are offered here with Low-cost text and logo engraving. An optional deluxe presentation box is available.